For ultimate all-around performance, the all-new SuperSix EVO strikes the perfect balance. 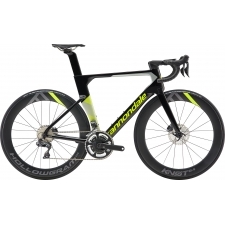 Its unrivalled blend of light weight, stiffness, aerodynamics and smooth-riding compliance gives you the winning edge on every part of the race course. 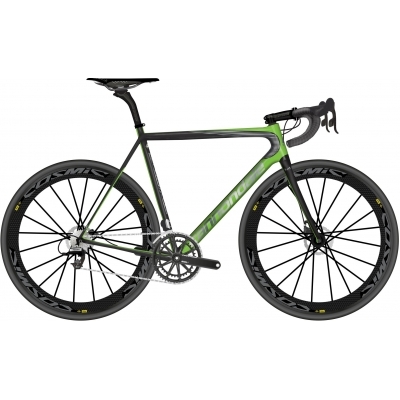 Designing the frame, fork and key components like crankset and seatpost together as a system can save hundreds of grams compared to competitors. 67 grams lighter system weight (frame, fork, headset, seatpost) than previous EVO. Less than 150 grams more than non-disc. One-piece, BallisTec carbon fork, continuous carbon fibre construction from dropout to top of steerer delivers great structural integrity. Crown-race-less design savers weight and improves fibre path for amazing strength-to-weight. New for 2017, the unreal control of discs, without the weight. Our flat mount integrated disc design adds less than 150 grams to the grameset, and maintains EVO's sweet ride characteristics. On many models, a flexing SAVE seatpost delivers up to 36% more deflection at the saddle than similar 27.2 seatposts, for bump-smoothing comfort when seated. Subtle TAP (Truncated Aero Profile) tube shapes in the downtube, seat tube, seat stays and fork reduce drag without the weight, stiffness and compliance compromises of regular aero profile tubes. Buy your Cannondale SuperSix Evo Hi-Mod Disc Team Di2 Carbon Road Bike 2019 from Revel Outdoors.